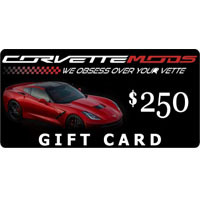 What do you give the Corvette collector who has everything? Why, more Corvette stuff of course! For many of us, too much of a good thing is just not enough. Now, you can indulge the passionate C4 Corvette collector or enthusiast in your life by gifting them the most sought after spoils from our line of 1984-1996 C4 Corvette gift items, and C4 Corvette logo items nonpareil. Simple or sumptuous, whatever their taste, we have what the heart of a cultivated Corvette collector cries out for. Loyal enthusiasts include racecar owners, show car owners, and folks who just love 1984-1996 C4 Corvettes. For them, heaven might be a fine leather wallet emblazoned with the iconic Chevrolet Corvette emblem. Is your C4 Corvette owner a golfer? Don't miss your chance to see their look of surprise when you present them with their own C4 Corvette golf club bag bearing the signature "Corvette" name flourished prominently on the sides of the bag, and Corvette emblem on affixed to the travel cover. Driving a Vette is about enjoying the open road. Now, your next road trip can be a fabulous expedition that you can eagerly look forward to. Our sporty '84-'96 inspired Corvette luggage collection includes travel bags, duffle bags, totes, and satchels. Our bags are made of soft lambskin or high-impact nylon and are easy to pack, keeping your travel essentials organized and within reach of the driver while out on the open road. 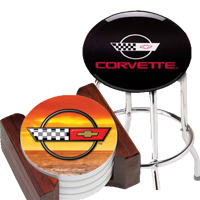 Indeed aftermarket parts make great gifts for C4 enthusiasts, but for that special occasion, there is no substitute for genuine C4 Corvette logo items, and nothing can match the impact of receiving any one of the many Corvette gift items in our collection.